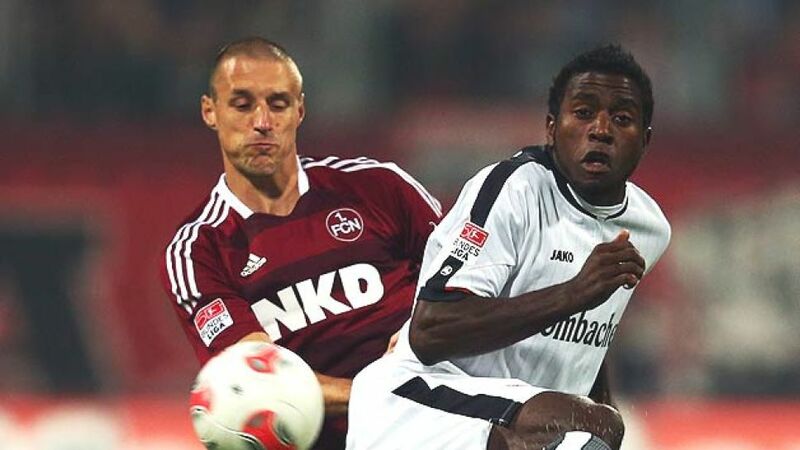 Nuremberg - Eintracht Frankfurt sensationally recorded their fourth straight win of the Bundesliga campaign with a hard-fought 2-1 success at 1. FC Nuremberg. After the hosts had started well, goals from Erwin Hoffer and Takashi Inui put the Eagles two ahead, before Sebastian Polter's strike ensured a fraught end to the match. Eintracht assume top spot in the table for the time being, with second-placed FC Bayern Munich taking on FC Schalke 04 tomorrow. Much of Nuremberg's rejuvenation since their shock DFB Cup exit to TSV Havelse had been down to the form of midfielder Hiroshi Kiyotake, and it was no surprise that the Japanese starlet was heavily involved in the home side's attacking play. In only the third minute, his inswinging free-kick allowed Tomas Pekhart to draw a finger-tip save from Kevin Trapp as Frankfurt were pinned back in the early stages. After Alexander Esswein had missed the target from a promising position, the visitors began to find their rhythm. Stefan Aigner had their first shot on goal when his effort was deflected behind, but when the resulting corner wasn't properly dealt with, Erwin Hoffer was on hand to arrow an angled shot past Raphael Schäfer and give Frankfurt an unexpected lead. It was a shock to the system for Nuremberg and Takashi Inui would have doubled the away side's lead but for two good save from the home keeper. Frankfurt's increasing confidence ensured an end-to-end affair. The energetic Aigner whizzed a dangerous ball across the face of goal, while Kiyotake tested Trapp with a stinging drive that the Eintracht keeper touched onto the post. Tempers then threatened to boil over following Javier Pinola's rash challenge on Sebastian Jung as referee Felix Zwayer brought first-half proceedings to a close. Dieter Hecking might have hoped the interval would give his charges time to regroup after a sloppy end to the first period, and his side did slowly improve. Yet just as the hosts were building up a head of steam, they conceded a second. Moments after Timm Klose's downward header had been cleared off the line by Sebastian Rode, Japanese international Inui upstaged his compatriot Kiyotake by ending a slaloming run with an accurate shot into the corner. Hecking threw on Polter and Mike Frantz in an attempt to give his side some more up front and the substitutions did the trick. After Hanno Balitsch had gone desperately close with a dipping half-volley from range, der Club finally pulled a goal back as Polter nodded in Kiyotake's free-kick. The goal gave the home side and the partisan crowd an obvious lift as Nuremberg began to dominate with wave after wave of crosses launched into the box. As the minutes wound down, the home side went all out in search of an equalising goal and came within inches of doing so with just three minutes remaining. Timo Gebhart, impressive since his introduction, laid an inviting ball across the box for Polter, but the 21-year-old cold only poke his shot wide with Trapp beaten in the last action of an enthralling contest.